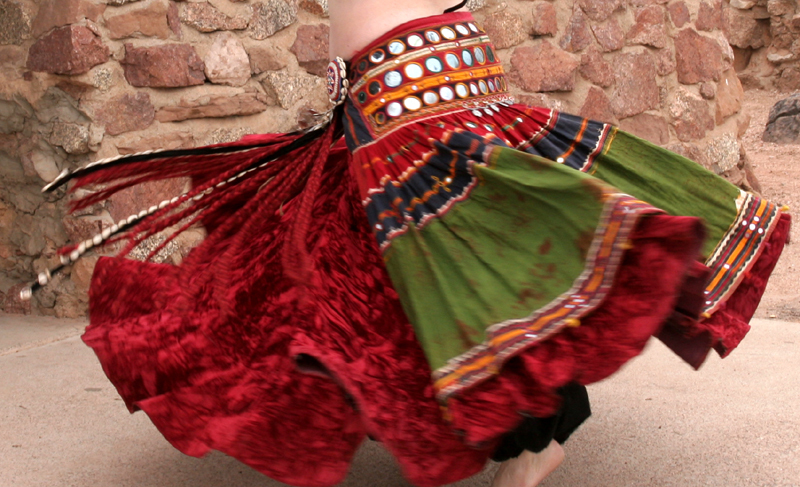 Yasmina is a performer, instructor and hosted The Joy of Belly Dancing TV show on Public Access in Arizona. She is the 2011 Headliner of the Year!!!! Yasmina won Arizona Favorite Tribal Solo Artist 2013 and Arizona's Lifetime Achievement 2013. She has been teaching for the City of Mesa since 1989 and teaches classes at the Mesa Arts Center. Yasmina performs many styles of Middle Eastern Dance and incorporates the use of many props, such as: sword, jug, canes, tray of candles, basket, fan veil and Voi. Her classes run all year round and consist of beginning and intermediate cabaret, beginning and intermediate tribal style classes. Check out the Mesa Arts Center website for class information and schedule of on-going and special performances of Yasmina. Her teaching style is of the same philosophy as her dance. She does not want her students to be carbon copies of her, but to learn all aspects of the dance. She teaches both the old and new styles of dance and is continually updating her skills to pass along to her students. She attends dance workshops, seminars and dance contests both in State and out of State to keep abreast of what is happening in the dance world. Yasmina also teaches workshops, in and out of state, with her Veil and Fan Veil class being the most requested. At Wiggles of the West Las Vegas she taught an Tribal Indian Fusion workshop in 2009, Fan Veil workshop in 2010 and 2011 along with single and double cane workshop. She has sponsored out of State artists in workshops that were both in dance and Middle Eastern Music. She was on the editorial staff of Wiggle Hips a belly dance magazine published by Janie and Chris the Two Old Bags which ceased publication in 2004. Yasmina was featured on the cover of Wiggles Hips in the June/July issue of 1999. In July of 2004 Yasmina took 2nd place and in 2006 she took 3rd place in the Headliner category at the Wiggle of the West competition. In 2011 Yasmina won the Headliner category at the very last Wiggles of the West along with taking 3rd place in the Alternative Wiggles category. Yasmina started her TV show along with her husband and family back in January 1990. After 13 years of producing the show the City of Mesa decided to no longer support Public Access TV and our show came to an end in Oct. 2003. The show was well received by the dance community and general public. The reason for producing the TV show was to show the public what belly dancing is all about and to dismiss the misconceptions of the dance. The Joy of Belly Dancing show was one of the longest Public Access TV shows in the Valley of the Sun. From the production of the TV show, Seven Veils Productions has branched out and produced five professional dance videos for the market. 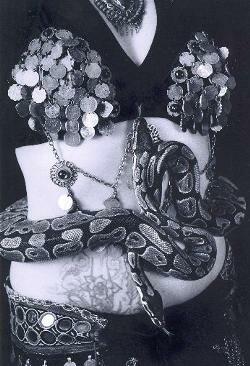 The first video, Yasmina, an American Belly Dance is a 30 minute performance tape of seven different dance routines. The next series of videos are, A Night in the Desert I, II & III. These videos are also performance videos. These videos were live performance shows highlighting dancers from Arizona. Night in the Desert I & II include eight different dancers performing with a live Greek Band. Night in the Desert III include seven different dancers performing with a live Arabic Band. The fifth video, "Yasmina Live! ", is a collection of highlights from the TV show, The Joy of Belly Dancing. All performances include live music from artists such as: Doug Adams, David Korup, Sirocco, Billy Woods and many more. Yasmina founded Troupe Baladi, a three member dance troupe in January 1994. The performance styles of the troupe were Tribal Fusion, Ethnic and flashy Cabaret. In 1996, Troupe Baladi took 3rd Place in the Wiggles of the West dance competition. Ambera and Yasmina represented Troupe Baladi at the Wiggles of the West dance competition July 2001. The troupe took 2nd place in the Mini Ensemble category. The troupe members have gone their separate ways with new interests in their lives. January 20th & 27th 2017 auditions were held for two new dance companies lead by Yasmina. Currently 10 lovely women are members of Moonlight Sirens Tribal Dance Company and their sister company Starlight Sirens Sister Tribal Dance Company. Our mission is to share our love of belly dance and the joy that it brings with the local community through performances, classes and workshops. Yasmina left the corp. world and went into belly dancing full time. Along with Malikah they started Shimmy Bliss Costuming Co. in Feb. 2004 and started creating and importing exquisite belly dance costumes. Malikah went to pursue her graphics design and photography business in May 2004 and Yasmina took the business on full time. With the change in ownership Yasmina has taken Shimmy Bliss in a new direction concentrating on the needs of the American Tribal Dancer. In 2014 Shimmy Bliss closed their doors. It was a great run and fun while it lasted. In 2015 Yasmina found another creative outlet, photography. Check out her photography website and contact Yasmina to schedule your dance photo shoot.